Start your tour at your hotel in the morning on a 2.5-hour sightseeing bus tour of Madrid discovering the most important monuments, avenues and squares. See locations such as the Gran Vía, Plaza de España, University, Moncloa, Calle Mayor, Puerta del Sol, Puerta de Alcalá, the bullring and Columbus square. 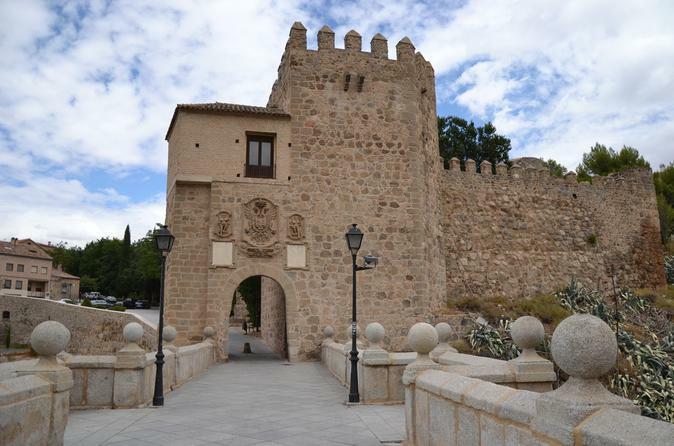 In the evening, you will go to Toledo and begin with a panoramic walking tour of Toledo. Enter the old quarters to visit the Plaza del Ayuntamiento, and admire the facade of the impressive Primate Cathedral, the old Palace of Justice and the City Hall. Continue your walk through the old Jewish quarter, with its narrow streets, to visit the Church of St. Tomé. Set your sights on the very famous painting of El Greco “The Burial of Count Orgaz”, the old Synagogue of Ste. Maria la Blanca, which remains as a symbol of the coexistence of the “Three Cultures” and the Monastery of San Juan de los Reyes. Follow with a panoramic tour by bus around the outskirts of Toledo, with a short stop to admire the views from the other side of the river, a great place to capture photos. Along the way back to the departure point, visit a typical factory of Damasquino, a well known handicraft art of Toledo.